Elon Musk’s big idea for the 21st century is the electric car, which he thinks can save the world (and make his investors a tidy profit to boot). Musk has gone and created a car that is, by every indication, one of the best-built cars in the world without exception. But Musk isn’t done yet, as he presses forward with another change to the way cars are built; the elimination of side mirrors. You might remember that when Musk debuted the Tesla Model X SUV, it had several features of note like the “falcon-wing” doors and the absence of side mirrors. Instead of the traditional wing-like mirror jutting out into the air, the Model X used small video cameras built into the doors with display cameras on the inside. This drastically improved the aerodynamics of the Model X, but also broke Federal safety regulations. As such, when the Tesla Model X reappeared at the Detroit Auto Show, it did so with side mirrors now attached. While Federal regulations requiring the addition of back-up cameras to cars was slated to go into effect this year, lawmakers have pushed that law back to 2015. That means Tesla has time to lobby lawmakers to rewrite the law to allow for the option of eliminating side mirrors and replacing them with video cameras. Getting rid of side mirrors could really streamline cars and improve aerodynamics at a time when fuel economy and performance are increasingly important. Some estimates say that by just getting rid of side mirrors, aerodynamics could improve as much as 5% overall. 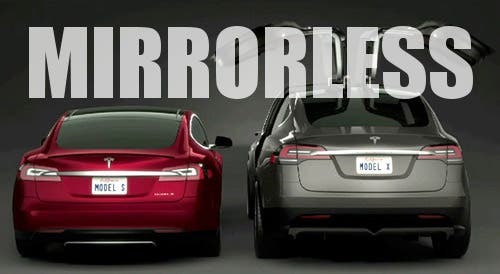 Cars like the Volkswagen XL1 have also eliminated side mirrors for efficiency, but Tesla is the only company really pushing for legislation changes. For such a small piece of the car, that’s a lot of efficiency to be gained.It’s surprising larger automakers haven’t pushed such an initiative forward before. Leave it to Elon, I guess.